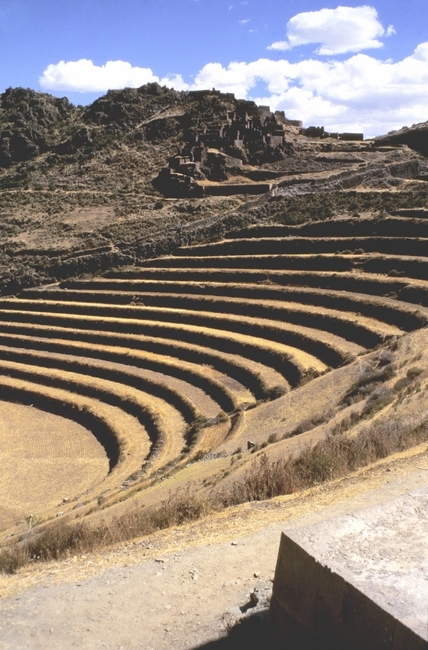 Abandoned ancient Incan agricultural terraces comprise the largest archaeological phenomena in the Western Hemisphere. This incredibly complex agricultural system covered millions of hectares and fed six million people at its height. The terraces were called andenes by the Inca, and some believe that this is where the cordillera got the name Andes Mountains. The andenes were composed of tightly fitted rocks which formed retaining walls. They were built on steep slopes one below the other. Once constructed, they were filled with soil. Many of these terraces were irrigated by gravity flow. Incan agriculture was plagued by having arable land with little water and a lot of water where there was little arable land. Surprisingly, there was very little sexual division of labor in the Inca Empire, and each household worked not only their lands, but communal lands as well. Throughout the empire significantly more farmland existed at the higher elevations than at the lower elevations. However, far fewer crops will grow at the higher elevations. For example corn, which they used to make beer, only thrives at lower elevations. In all, ninety percent of Andean crops thrive below the 3,000 foot altitude, and only 20 percent do well above 9,000 feet. The Incas divided their empire called Tahuantinsuyu into four quarters. Of these, Collasuyu was the largest and southernmost. The most productive of Collasuyu's lands surrounded the great Lake Titicaca forming a fertile bread basket. Here there is an abundance of flat farmland. However, the high altitude, sporadic rainfall, poor soil, and a short growing season provides only the hardest of crops the opportunity for survival. Around Lake Titicaca the Incas farmed 60 varieties of potatoes, as well as two domesticated grains called quinoa and canihuas. Above the 12,000 foot elevation the Incas grazed herds of llama and alpaca. At these extremely high elevations the animals would feast on the dry puna grasslands, and turn it into valuable fertilizer that was critical to crops. The easternmost quarter of the empire was called Antisuyu, and it stretched all the way to the fringes of the Amazon jungle. This rugged topography provides very little opportunity for farming. However, there are a wide variety of agricultural zones. Each of these zones receives different amounts of rainfall, sunlight, temperatures, and time of cultivation. Here, we found and still find, potatoes and quinoa being grown at the highest elevations, and manioc and tropical fruits growing on the jungle floor. Tropical fruits harvested by the Incas included papaya, pineapple, and avocado. Also grown in the Antisuyu quarter were cotton, corn, peanuts, and coca. From the city of Cuzco to the Pacific Ocean was the quarter the Incas called Cuntisuyu. Normally, there is no rainfall below 6,000 foot elevation in this region. This part of the empire was very impoverished and mostly desert. It consisted of 15 short rivers that supported some agricultural terrace farming. Largely, the people who inhabited this area made great us of their marine resources, and hunted wild camelids that were similar to alpaca and llamas. Chinchaysuyu, was the second largest quarter and it encompassed Ecuador, and two-thirds of Peru. It stretched from Cuzco all the way to present day Columbia. This quarter included large expanses of dry grasslands and rivers that are cut so deep into gorges that they allow little opportunity for agriculture. 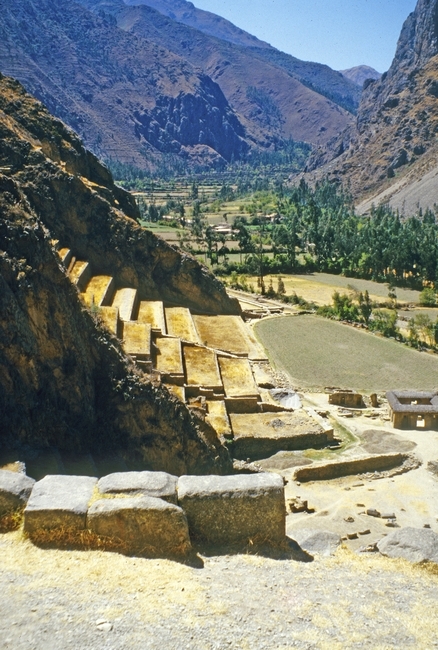 However, the quarter contained numerous irrigated oasis valleys in the western desert that produced the highest crop yields in the Inca Empire.